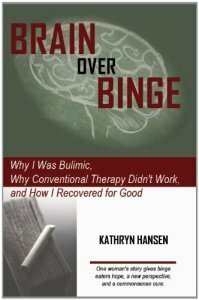 I had the honor of interviewing Kathryn Hansen, the author of Brain Over Binge, last week and I’m excited to share the recording with you here. You can jump to very bottom if you just want to listen to the interview now. In case you don’t know the book Brain Over Binge I want to give Kathryn a huge plug for writing a wonderful book that’s filled with lots of practical advice (read my book review here). 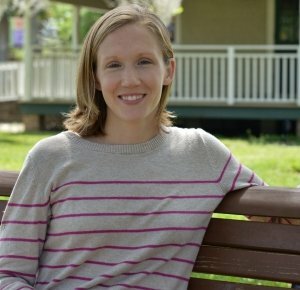 In her book Kathryn shares the story of her journey through years with bulimia and then trying to recover with therapy and traditional methods. When she finally recovered on her own it was because she read the book Rational Recovery which was written about 20 yrs ago. Kathryn’s book is full of really helpful information about how the brain works so you can, with a few simple and effective practices, help yourself stop your out-of-control urges to binge. The information Kathryn shares in her book is a great start for someone who has maybe tried other methods or traditional therapy and nothing’s worked and want to take matters into their own hands and hearts. Having used self-help to recover from bulimia myself over nine years ago I assure you what Kathryn shares can work for a lot of people suffering with bulimia or binge eating disorder. When I first contacted Kathryn about the interview we both agreed that it was super important that we really share with listeners the how to’s of bulimia recovery so anyone who is motivated and ready to get started can find their way to stopping the urge to binge as soon as today. If you want to learn more about Kathryn’s story, please pick up her book Brain Over Binge on Amazon, visit her blog/website or stay tuned because I have a feeling she and I are going to be collaborating more in the coming years. I hope you’ll pick up the book, but allow me to share with you a summary of what Kathryn shared during our interview. During the recorded interview, I asked Kathryn to share her five steps to recovery. She graciously did and pointed out that the steps are more like guidelines or things to consider and not meant to be done in some order. I like to think of them as tools in your toolbox that you use as you work recovery. One of the first things I teach new coaching clients is to recognize that the brain is part high consciousness (highest human brain Kathryn calls it) and part survival mechanism (or frontal cortex – I think of it as your Monkey Mind and Jenny Schaefer’s book would probably consider this “ED” or your binge eating crazy mind/enemy). You want to begin to realize perhaps a new paradigm that you HAVE thoughts, you are not your thoughts. When you begin to recognize the useless, nasty, hurtful thoughts you have are part of that survival brain sending you signals out of habit patterns you can begin to regain your power. Remember: who you are is a higher level conscious self, I call it your Wise Woman. Then you can become more aware that your survival brain will send signals, or thoughts, of self-defeating actions you can take to perpetuate your binge eating. When you are in your Wise Woman, your highest consciousness, you can detect the difference between the lower, survival human brain thoughts. Low level survival thoughts are always negative, self-defeating, rushed/panic-like, hurtful and all sort of negative things. Your highest, Wise Woman self is always in a place of love, adoration and timelessness. When you can become the observer, your Wise Woman, your most empowered self, you can then observe the lower, survival brain binge thoughts for what they are. Junk. Just stuff floating through your brain that you DO NOT have to act upon. The trap we fall into when we forget who we are is an empowered woman, a higher conscious observer is to believing that we have to a) believe every thought we have and b) act on every thought we have. Believe me when I say I KNOW the thoughts FEEL like you can’t resist them. I totally freaking get it. After 20 years of reacting to my survival thoughts and not realizing I didn’t have to binge – I spent many a day wishing I knew this information you’re learning now. The freedom from bulimia and the urge to binge comes when you STOP reacting to the urge. You begin to disassociate from the thoughts and remember that you are an observer having thoughts, you are not those thoughts. They can’t hurt you. They can’t make you pick up the food. They can’t tell anyone lies or hurtful things – those thoughts all literally live in the matter inside your brain. In the recording Kathryn and I both give ideas about how to do the stopping part, so check it out for more details/practical how-to’s. Once you just allow the thoughts to happen instead of immediately acting on the binge urge, you’ll begin to train your brain that you’re not interested in keeping that linked up (ie eating large amounts of food isn’t a good thing so stop sending me the urge). One of the things I shared in the interview is the fact that even today I find myself with other urges to do things that I don’t think I want to do or are good for me. For example, coming home and having a drink after work during the week is ok once in a while, but not regularly. I found myself a few weeks ago with an urge to have a drink after work for no good reason. I literally sat on the couch and noticed the inner conversation my survival brain was trying to have to get me to take a drink. I knew in my highest self that I didn’t want to have a drink. So after about 60 seconds of noticing and not acting on the urge to drink it merely got quiet up there and I went on with my evening. (just 60 seconds!) It felt like I just surfed a wave of fierce emotion, or urge, and when I didn’t give it energy or give into it, it just dissipated. In that moment of not acting on that urge, I started to re-train my brain to not send that signal again. That’s the same thing you do with stopping the urge to binge. This is probably my favorite step of the whole series. When you get excited about what you’re doing, remember the power is yours, and find yourself with small wins over the urge….freakin’ celebrate it! I don’t mean celebrate by eating or drinking, but take a moment and acknowledge yourself for the win. Show and teach the brain that not reacting to the urges is important to you. The brain is trying to win, or survive, and teaching it that you get to win when you don’t binge is just the kind of reinforcement it needs to stop sending you the wrong signals and start sending you better ones. There is more information and details Kathryn and I both share in the interview than I was able to cover here, but I hope this post has been helpful to you. The interview is about an hour long, so I hope you’ll stop and listen to it and be sure to take notes. Click on the arrows/play button below to listen in…enjoy! My invitation to you as you listen to the interview is to find 1 or 2 things (gems of wisdom) that resonate for you and take them into your life. What will you DO once you turn off the recording? Now go do that! UPDATE 2016: I’ve recorded a podcast with Kathryn to introduce her second book, Brain over Binge Recovery Guide. You can read/listen to that post here. My two most inspiring bulimia mentors united, amazing! Very excited to see what you’ll do together. Hopefully something that will help me get rid of those binges for good. Cheers to your collaboration! Thanks so much for the kind words and we are definitely up for collaborating more in the future. Kathryn’s a super cool lady and tapped into some really great data about the way the brain works. I hope this was helpful to you and look forward to hearing from you again. Im listening to this and checking Amazon for the book. Cant wait to read it. I totally now believe in our brain chemistry playing into urges after reading The Mood Cure and taking l-tyrosine, the desires and incidences drop dramatically when i take it. When I dont i feel the difference. Thanks for stopping by Karen…and I’m glad you’re exploring this realm of recovery. It’s a newer direction for how to recover than many traditional methods, but I hope you’ll find it’s both helpful and totally possible for yourself, too. Please check back in and let us know how you’re doing, ok? !